This work was carried out in 2006-2007 at Bogomoletz institute of physiology and International center for molecular physiology (Kiev, Ukraine). Yuriy O. Kolodin carried out electrophysiological recordings and wrote manuscript. Oleksii O. Grygorov carried out polymerase chain reactions . National Academy of Sciences of Ukraine). Last updated: 27 April 2008. Intrinsic firing properties of retinal ganglion cells (RGCs) of mature (1 month old) rat were studied in retinal flat-mounted preparations using whole cell current clamp recordings. In response to 500-ms depolarizing current step the majority (94.1%) of the examined RGCs (n=85) displayed sustained firing that lasted for the duration of the depolarization period (tonic RGCs). In addition, 63.5% of the cells had clearly a tonic fast-spiking phenotype with the steady-state firing frequency in the range 50-124 Hz. The rest few (5.9%) RGCs always displayed transient firing accommodated within duration of the current steps (phasic RGCs). Ionic conductances underlying excitability in tonically firing neurons were studied by applications of selective pharmacological blockers. Application of TTX (1 μM) caused reversible disappearance of action potentials (APs) in response to stimulus. Suppression of Ca2+ influx through voltage-activated Ca2+ channels by 200 μM Cd2+ resulted mainly in moderate increase of steady-state firing frequency and increase of single AP repolarization rate, however, without abolishing the basic pattern of tonic firing. Physiological roles of different types of voltage-gated potassium channels were studied using applications of respective blockers. It was found that potassium conductance highly sensitive to external TEA (1 mM) or 4-aminopyridine (4-AP, 200 μM) is responsible for fast repolarization and afterhyperpolarization of a single AP, providing the cells with the ability for high-frequency firing. Potassium conductance sensitive to α-dendrotoxin (α-DTX, 100 nM) did not play such a role. The known specificity of these drugs strongly suggested that this 4-AP and TEA-sensitive conductance is mediated by Kv3 potassium channels. The prominent role of Kv3 conductance was also suggested by fast-spiking phenotype of the cells. Single-cell RT-PCR experiments confirmed the expression of Kv3.1 and Kv3.2 mRNA in the RGCs. Thus, in tonically firing rat RGCs, TTX-sensitive Na+ and Kv3 K+ currents generate a basic firing pattern, while Ca2+ and Ca2+-dependent conductances only moderately regulate discharge frequency. Keywords: Shaw Potassium Channels; Action Potentials; Drug effects; Whole-Cell Recordings; Patch Clamp Techniques; Reverse Transcriptase Polymerase Chain Reaction; Retinal Ganglion Cells. Retinal ganglion cells (RGCs) are the only output neurons of the retina of vertebrates. All electrical signals generated by photoreceptors are transmitted by downstream retinal cells and eventually converge onto RGCs. Thus, the physiological function of RGCs is to receive synaptic inputs, to integrate them and transmit the visual information to the central nervous system in the form of trains of spikes. Intrinsic electrical properties of neurons play a very important role in this postsynaptic integration, so, the continuously updated visual information transmitted to the brain by RGCs is the result of interplay between the extrinsic synaptic inputs and their intrinsic physiological properties. Thus, investigation of intrinsic properties of RGCs is very important for understanding mechanisms of processing and coding of visual information. A number of previous studies examined the spike output and intrinsic membrane properties of RGCs of different species at various developmental ages [2;8;10;11;17;18;23;29;33]. Some of these reports indicate that intrinsic firing patterns of RGCs could aid synaptic inputs in shaping light responses, and membrane properties of the cells contribute to the functional differentiation of RGC types [18;29]. The task of encoding spike activity derived from synaptic inputs is achieved through a large array of voltage-dependent ion channels and respective conductances. At present time, a variety of these channels and conductances have been described in RGCs by means of electrophysiological recordings [1;10-12;26;28;30;34], immunohistochemistry [22;35], in situ hybridization  and RT PCR [10;11;22]. Although computational model of ganglion cell firing incorporating various voltage dependent conductances have been generated , the physiological role in spike activity encoding of many of these types of channels expressed in RGCs is not absolutely clear. Also there is a relatively small number of studies that were carried out on retinal ganglion cells of mature mammals. However, comparison of the reports concerning mature mammalian species with analogous reports concerning other vertebrates shows serious distinctions between the species even in such fundamental properties as intrinsic firing patterns of the RGCs (compare reports concerning RGCs of mature cats or rats, describing the sustained nature of the intrinsic spike generating mechanism of almost all neurons [18;33] and analogous reports concerning RGCs of other non-mammalian vertebrates [11;17;29]. The large part of the latter cells has transient (phasic) nature of the intrinsic spike generating mechanism.). Also, excitability and ionic conductances of RGCs of mammals are changed dramatically during ontogenetic period [26;33]. Thus, available data concerning roles of different types of conductances in shaping firing patterns of RGCs of 5 days old mice  could not be fully extended to describe these roles in more mature mammals. All above-mentioned reasons make imperative to study intrinsic firing properties and ionic conductances underlying excitability of RGCs of mature mammals. The objective of the present study was to characterize the intrinsic electroresponsive properties of RGCs of mature (1 month old) rats. Our study was carried out using the whole cell current-clamp recordings from RGCs within an isolated flat-mounted retina preparation. The role of different types of ionic conductances (sodium, calcium and different types of potassium) in shaping the definite firing patterns of retinal ganglion cells were studied using applications of pharmacological substances, which inhibited these conductances selectively. Such approach allowed us to make conclusion about the physiological role of TTX-sensitive sodium, voltage-gated calcium, and definite (Kv3) type of potassium conductance in the RGCs of mature rat. Recordings were made from cells in retinal flat-mounted preparations of one month old albino Wistar rats. Animals were killed by CO2 asphyxiation and decapitation in accordance with the Ukrainian Academy of Science Policy Statement concerning animal research. The eyes were enucleated and hemisected at the ora serata. Each retina was isolated by peeling from the pigment epithelium and finally separated from the eyecup with a cut at the optic disk. Pieces of retina (3-12 mm2) were mounted, ganglion cell layer up, on the bottom of the perfusion chamber coated with sylgard by pinning with needles (diameter 15 μm). The chamber was mounted on the stage of an upright microscope (Olympus BX 51 WI, Olympus Optical Co., Japan) equipped with 40´ water immersion objective. All manipulations were performed in extracellular solution (see below). All recordings were carried out in the chamber constantly perfusing with extracellular solution contained (in mM): NaCl 140, KCl 3, CaCl2 2, MgCl2 2, 4-(2-hydroxyethyl)piperazine-1-ethanesulfonic acid (HEPES) 10, glucose 12, pH 7.35-7.41 (adjusted with NaOH). The intracellular patch-pipette solution for whole cell recordings contained (in mM): K-gluconate 100, KCl 50, MgCl2 5, ethylene glycol-bis(2-aminoethylester)-tetraacetic acid (EGTA) 10, HEPES 20, pH 7.4 (adjusted with KOH). To attain whole cell access, the inner limiting membrane overlying the recording area was removed by brushing the retinal surface with the tip of a glass patch pipette . To do so, we advanced the tip of a patch pipette approximately into the optic fibre layer and moved the pipette horizontally and then vertically. Recordings were made from uninjured cells exposed during the procedure. Whole cell recordings from the RGCs were obtained by standard procedures using an intracellular amplifier (Axoclamp-2B, Axon Instruments, Inc., USA). Initial pipette resistance ranged between 5.5 and 10.5 MΩ. The pipette voltage in the bath was nulled prior to recording. Recordings were made in the bridge current-clamp mode of the amplifier. All of the procedures and recordings were performed at room temperature (t ~ 22°C) and under relatively bright illumination with visible light. Such conditions presumably caused the bleaching of the photopigment in the photoreceptors  making the retina insensitive to the light. Pipette resistance and capacitance were compensated by adjusting the bridge and capacitance neutralization circuits of the amplifier prior to recording. Voltage values reported in this study have been corrected a posteriori for a liquid junction potential of −10.7 mV, as calculated using Clampex 8.2 software (Axon Instruments, USA). The “resting” (i.e. steady-state because of maintained activity) potential was measured after the whole cell recording configuration was established and rechecked periodically throughout the recording period. Cells were excluded from analysis if their resting potentials became depolarized substantially more than −50 mV. For several cells we recorded ongoing activity (i.e. firing evoked by intrinsic conductances and synaptic input only, holding current was equal to zero in these recordings). To evaluate discharge properties of the cells, 500-ms depolarizing current injections were used. Membrane potential of each cell was hyperpolarized by steady current injection prior to the depolarizations. This was done to minimize spontaneous firing (induced by synaptic input and intrinsic conductances) between depolarizing current injections, which was apparent in the majority of the cells, and to fully cancel the inactivation of sodium conductance. All recordings, unless otherwise specified, were made holding the neurons at interpulse potential Vh ~ −80 mV (Vh in no case was more negative than −90 mV). Single action potential (AP) amplitude (measured from AP threshold) in all cells, included into this study, was never less than 55 mV under mentioned conditions. Non-ganglion cells in the ganglion cell layer (displaced amacrine cells) generally showed no spikes with such large amplitude [19;31]. The large AP amplitude similar to large amplitude of the inward sodium currents [32;33] suggested that each recording cell was RGC. Also, diameter of somas of displaced amacrine cells in the rat are mainly <10 μm , and we did not record from such small cells. An existence of clearly detectable initial segment-soma-dendritic (IS-SD) break (see Results) in majority of the cells in this study strongly suggested presence of axon. Our pharmacological and single-cell RT-PCR experiments were carried out only on tonically firing neurons with the possibility to detect IS-SD break in ~ 90% of the cells. Although we realize that very few subset of the cells in this study could be displaced amacrine cells, we will refer to all the cells as “ganglion cells” in the remaining text. Membrane currents and voltages were controlled and recorded with Digidata 1322A (Axon Instruments, USA) digitizer connected to a computer running pCLAMP8 software (Axon Instruments, USA). Current and voltage signals were sampled at 20 kHz, and analysis of these waveforms was performed using Clampfit 9.0 (Axon Instruments, USA) software. In most cases input resistance, membrane time constant, and whole cell capacitance were estimated from the averaged (~100 episodes) low-amplitude electrotonic potential evoked by hyperpolarizing current injections (500 ms, −5.. −100 pA). The time course of this averaged electrotonic potential was roughly exponential. Averaging of many episodes was especially needed for those cells, which manifested prominent voltage fluctuations evoked by synaptic input . In some cases prolonged dialysis for tens of minutes led to decrease of input resistance of the cell. In some cells the decrease of input resistance accompanied with negative shift of resting potential, presumably due to increase of membrane permeability mainly to potassium. This phenomenon and rundown of currents led to modifications of firing patterns decreasing the firing frequency. In a few cases we even observed sustained spiking cells convert into a transient spiking phenotype on prolonged dialysis, however, the reverse was never seen. For this reason input resistance was continuously monitored during experiment, and all measurements after significant change (more than 50%) in input resistance were discarded. In a few cases we observed a sudden increase of access resistance, which led to significant change in electrotonic potential and reduction of AP amplitude. Such recordings were rejected from the present analysis. We tested each cell with a series of depolarizing 500-ms current steps. Current strength was increased at small increments. Increment was chosen individually for each cell to record firing patterns at different stimulus strength. If the increment was too small, we observed almost identical firing patterns at several consecutive stimuli. In those cases increments were increased. Thus, the current increments used in our experiments were in the very broad range (from 5 pA to 100 pA) due to different input resistances of the cells. The interval between current steps was 6 seconds in all experiments. Single AP shape parameters were measured from first spikes evoked by near-threshold depolarizations from Vh ~ −80 mV (in some cases just-suprathreshold current steps evoked spike bursts then we measured shape parameters of the first AP in the burst). We determined such AP shape parameters: threshold (mV), amplitude (mV), overshoot (mV), undershoot (mV), afterhyperpolarization (mV), depolarization and repolarization rates (mV/ms), width (ms). AP threshold was measured as the inflection point in the voltage trajectory preceding the AP, where the membrane presumably becomes strongly regenerative . This inflection point was determined on inspection of the first time derivative of the voltage waveform. Inflection point was determined as the point, at which the first derivative exceeded its maximal noise value in the period preceding AP onset (this value was ~10 mV/ms). Practically, this method found the potential at the moment of activation of regenerative inward sodium current, because the first derivative of voltage waveform is proportional to the transmembrane current charging the membrane I = C(dV/dt). AP overshoot was determined as the value of potential at the AP peak. AP amplitude was calculated as the difference between the peak and the threshold of the AP. AP undershoot was measured as the voltage minimum following AP peak. AP afterhyperpolarization was calculated as the difference between this minimum and the threshold of the AP. Depolarization and repolarization rates of the AP were computed from the maximum and minimum of the first derivative of the voltage waveform. AP width was measured at half the AP amplitude. Tonically firing neurons generated repetitive discharges that lasted for the duration of the 500-ms depolarization period in response to stimulating current in the certain range. We referred to this range of stimulating current as to tonic range. Each cell had its own such range. Larger depolarizing current steps drove the cells into spike block within the pulse (some cells generated low-voltage (<30 mV) oscillations at the end of the stimulus in response to such stimulations; these oscillations were not considered as spike generation). Smaller depolarizing current steps did not evoke tonic firing (they could evoke only transient or very irregular spike trains). Instantaneous frequency (1/interspike interval) was computed from trains of spikes. RGCs tested generally showed some spike frequency adaptation during depolarizing current steps. This adaptation occurred mainly at the first 100-200 ms of the stimulus, so we computed steady-state firing frequency (Hz) for tonic discharges as the average of instantaneous frequency for the last 100 ms of a stimulus. Steady-state firing frequency was larger for larger stimuli in tonic range, so, for each cell we computed maximal steady-state firing frequency from the spike train, evoked by the current strengths close to maximal in tonic range (see Figure). Active substances were dissolved as stock solutions at not less than 100 times the final concentration, diluted in extracellular medium just before use and superfused through the bath. Perfusion chamber volume was 0.9-1.2 ml, so we superfused 12-20 ml of new solution for solution exchange. All blockers were purchased from Sigma (USA). Student’s t-test was used for statistical data comparison. Unless otherwise specified, error measurements are reported as S.E.M. Methods for single-cell RT-PCR with two rounds of amplification were similar to those described previously . Patch-pipettes used for RT-PCR experiments (5.5-9 MΩ) were filled with the standard intracellular solution (see above, volume – 3 μl). Every RGC selected for analysis was primarily subjected to electrophysiological recordings in order to test the ability of the cell for tonic firing. Then, the cellular cytoplasm was sucked off by applying negative pressure (suction time – 1.7-8 minutes). We increased the rate of extracellular solution perfusing during this manipulations to reduce contamination. Extracellular solution instead of cellular cytoplasm was sucked off at the same conditions near the cells to control possible contaminations (see below). The harvested material from an individual retinal ganglion cell was blown into a test tube containing 0.5 μg random hexamer primers (0.5 μg/μl, Promega), 8 U of RNase inhibitor Ribolock (40 U/μl, Fermentas), 5.8 μl nuclease-free water (Fermentas) and stored on ice (or frozen) until use. Then, this mixtures were heated to 70° C for 5 min and immediately cooled on ice. After addition of each of the four nucleotide triphosphates (dNTPs, Promega; final concentration – 1 mM), 20 U Ribolock, 200 U of RevertAidTM M-MuLV Reverse Transcriptase (200 U/μl, Fermentas), 4 μl of 5X reaction buffer (Fermentas) the reverse transcription was carried out for 5 min at 25° C, 60 min at 42° C, 10 min at 70° C in a final volume of 20 μl. Then, the single-stranded cDNA mixture of individual RGC were divided into two parts (9 μl each) and used for separate two-round PCRs for amplification of Kv3.1 and Kv3.2 potassium channel nucleotide sequences. 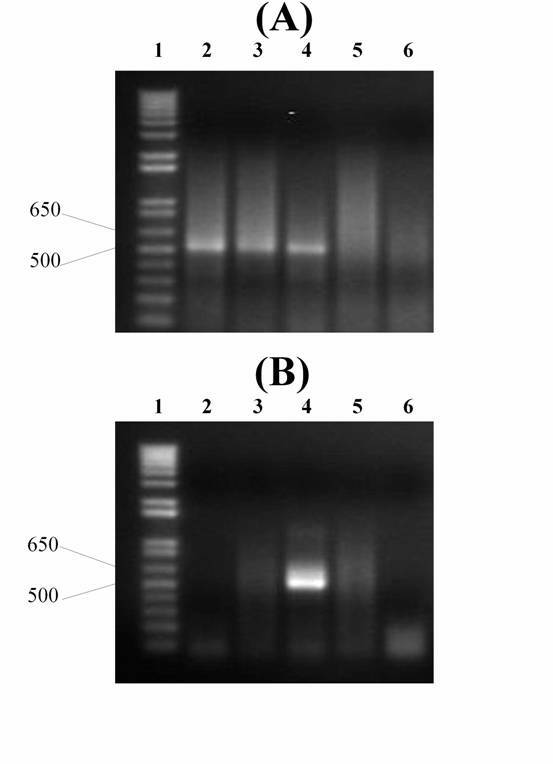 The first round was performed in the final volume of 50 μl containing: 9 μl of the cDNA mixture, 0.8 μM gene-specific primers (see below), 5 μl 10X Taq buffer (750 mM Tris-HCl, pH 8.8, 200 mM (NH4)2SO4, 0.1% Tween 20; Fermentas), 1.5 mM MgCl2, 40 μM of each of the four dNTPs, 1.5 U of recombinant Taq DNA Polymerase (5 U/μl, Fermentas). The second round was carried out in the final volume of 25 μl containing: 3 μl of the first round template, 0.8 μM primers (see below), 2.5 μl 10X Taq buffer, 2 mM MgCl2, 0.2 mM of each of the four dNTPs, 0.9 U of recombinant Taq DNA Polymerase. Primers in the two rounds of amplification were nested and intron-overspanning. Primer sequences and locations (referring to published sequences in GenBank of the National Center for Biotechnology Information, ncbi.nlm.nih.gov) were as follows : Kv3.1 (accession number X62840): Upper primer, 5'-CAA GAG ATT GGC GCT CAG TGA C-3' (742-763); lower primer, 5'-CCC AG(AG) GCC AG(AG) AAG ATG AT(AC) AGC A-3' (1326-1350); lower nested primer, 5'-AA(AG) TGG CG(GT) GT(ACG) AGC TTG AAG AT-3' (1247-1269). Kv3.2 (M59211): Upper primer, 5'-TTG AGG ATG CTG CGG GGC TGG-3' (611-631); lower primer, same as for Kv3.1 (1187-1211); lower nested primer, same as for Kv3.1 (1108-1130). The primers were ordered from Sigma. The cycling conditions for both rounds were: 95° C for 3 min, after a hot start, 35 step cycles (95° C for 30 sec, 57° C for 30 sec, 72° C for 45 sec), and 72° C for 10 min. Positive controls for all reactions were run using thalamic RNA (kindly provided by Oleksiy Boldyryev, International Center for Molecular Physiology, Kyiv, Ukraine), in view of strong expression of Kv3.1 and Kv3.2 transcripts in different thalamic nuclei . Two controls for possible contamination artifacts were performed using water and extracellular solution instead of template for each RT-PCR amplification. Negative controls gave negative results. The overall sample of retinal ganglion cells from which recordings were made in the current clamp mode contained 85 neurons obtained from 39 animals. For all these cells we estimated resting potential, then obtained firing patterns at different stimulus intensities and measured AP shape parameters and firing frequencies. For 79 cells in our sample we also estimated capacitances, membrane time constants and input resistances. All these values with respective ranges are listed in table 1. Estimations for passive membrane parameters and some of AP shape parameters varied in the broad ranges and did not follow a normal distribution (Table 1, see also histograms 1 and 2). This was an apparent indication that our recordings were made from RGCs of different types (see Discussion). Table 1. Electrophysiological characteristics of rat RGCs. The distributions of that values were tested using Shapiro-Wilk normality test. For the values that did not follow the normal distribution the value of P is indicated in the table. Note that few cells (n = 6, i.e. 7.0%) had a depolarized value of undershoot relative to value of threshold. The calculated value of the difference between the undershoot and the threshold of the AP was positive for such cells, nevertheless, we also refer to this value as to “afterhyperpolarization”. All values for AP shape parameters were calculated for APs evoked from Vh ≤ −80 mV. Single APs of the neurons studied were characterized by a short AP width (Table 1). The numerical time derivative of voltage waveform allows to detect the IS-SD break (see figures 2B, 3B). This feature was an indication that these spikes recorded at the soma were initiated on neighboring membrane with a lower threshold (axon initial segment membrane [5;27]). We could detect the IS-SD break at least in some of spikes in majority of the cells included into this study (86%). The majority of RGCs (94.1%) displayed sustained spike trains that lasted throughout the stimulus period in a certain range of current stimulus intensity (see figures 2A, 3A, 6A; also see figure B). All analyses of firing properties, including the experiments with drug application were performed only on these tonically firing neurons. Tonically firing neurons were generally characterized by high maximal steady-state firing frequency (Table 1). Maximal steady-state firing frequencies were larger than 50 Hz in majority of RGCs (Fig.1). So, most of them could be definitely classified as fast-spiking neurons [4;7;13]. Fig. 1. Histogram of tonically firing RGCs maximal steady-state firing frequencies (n = 80). Note that maximal steady-state firing frequencies were larger than 50 Hz in 67.5% (54/80) of the tonically firing RGCs (or 63.5% (54/85) of the all 85 ganglion cells recorded) and their maximum observed in our experiments reached the value of 124.2 Hz. Only few (n = 5, i.e. 5.9%) recorded RGCs were not capable of repetitive firing throughout a depolarizing current pulse (phasic cells) (see figure A). These cells did not display sustained firing even when stimulus intensity was varied in very small increments (2 pA, n = 4). However, capacitance and other electrophysiological parameters of phasic neurons (AP shape parameters, passive membrane parameters) were in the same range as of tonically firing cells (see table). We prehyperpolarized the cells to ~ −80 mV to prevent firing between the current steps (see Experimental Procedure). However, in some tonically firing neurons it caused recognizable effects after termination of the prehyperpolarization, which could be clearly distinguished in firing patterns recorded at the beginning of stimuli. These were “rebound excitation” [12;14;17] and “ramping” . Varying Vh in the range from resting potential to ~ −80 mV showed, that rebound excitation had the pronounced influence on spike output at the beginning of the depolarizing current step, however, did not profoundly change the maximal steady-state firing frequency of the cells, calculated at the end of the stimulus (changed by 2 ± 10%, n = 5, P = 0.9) (see figure A). We calculated the shape parameters of a first rebound spike for such cells as their AP shape parameters. Ramping was clearly exhibited only by a very small subset of tonically firing neurons. However, this phenomenon also seemed to influence the spike output at the beginning of the stimulus without prominent influence on the maximal steady-state firing frequency, calculated at the end of the 500-ms current step (see figure B). According to the firing patterns recorded, we estimated the percentage of the cells with rebound excitation and ramping as 37.5% (30/80) and 7.5% (6/80) of tonically firing ganglion cells. All experiments with variation of Vh (n = 10) showed that prehyperpolarization to ~ −80 mV did not abolish the ability of tonic cells for sustained firing at some of the applied stimuli. Few phasic cells also did not change the intrinsic nature of their firing with variation of Vh. An ability to fire spikes at high frequencies is commonly associated with expression of Kv3 potassium channels in neurons [13;24;25]. Kv3 channels are blocked by low concentrations of external tetraethylammonium (TEA) or 4-aminopyridine (4-AP) (Kv3.1-Kv3.2 channels half-maximal inhibitory concentrations (IC50) are not exceeding 0.2 mM for TEA and 0.1 mM for 4-AP ). We applied both of these substances to investigate the role of Kv3 conductance in the RGCs. Bath application of 1 mM tetraethylammonium chloride (TEA) or 200 μM 4-aminopyridine (4-AP) produced the same profound changes in AP shape and repetitive firing properties of the cells (Fig. 2A, B; 3A, B). Maximal steady-state firing frequency was decreased after application of TEA or 4-AP, so fast-spiking phenotypes of neurons was converted into a substantially slower spiking mode after addition of these drugs (Fig. 2A, 3A; Table 2). Fig. 2. Tetraethylammonium (TEA; 1 mM) impairs AP repolarization and slows high-frequency firing of RGCs. (A) left panel shows repetitive firing of RGC under control conditions. Right panel shows the responses to identical currents in the presence of 1 mM TEA. TEA profoundly reduced the steady-state firing frequency for the all intensities of stimulating currents. Amplitudes of stimulating current steps are indicated near each pairs of traces. 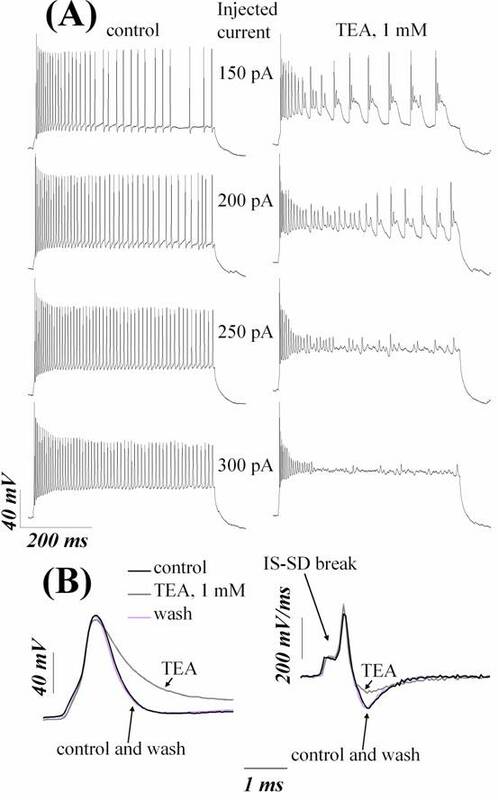 Holding current –220 pA. (B) 1 mM TEA caused AP broadening of a neuron by reducing repolarization rate and suppressed afterhyperpolarization of single APs evoked by near-threshold depolarizations. Left panel shows voltage waveform. Right panel shows numerical time derivative of this waveform. The initial segment-soma-dendritic (IS-SD) break is indicated by arrow. (A) and (B) are from different cells. Fig. 3. 4-aminopyridine (4-AP, 200 μM) impairs AP repolarization and slows high-frequency firing of RGCs. (A) left panel shows repetitive firing of RGC under control conditions. Right panel shows the responses to identical currents in the presence of 200 μM 4-AP. 4-AP profoundly reduced the steady-state firing frequency for the all intensities of stimulating currents, which are indicated above each pairs of traces. Holding current –210 pA. (B) 200 μM 4-AP caused AP broadening of a neuron by reducing repolarization rate and suppressed afterhyperpolarization of single APs evoked by near-threshold depolarizations. Left panel shows voltage waveform. Right panel shows numerical time derivative of this waveform. IS-SD break is indicated by arrow. (A) and (B) are from different cells. TEA and 4-AP also profoundly changed single AP shape by influencing the repolarization and afterhyperpolarization without compromising AP threshold and depolarization (Fig. 2B; 3B). Afterhyperpolarization was eliminated nearly completely after addition of these drugs. Absolute value of repolarization rate was substantially decreased after application of TEA or 4-AP. The apparent increasing of the AP width was due to reduction of repolarization rate, because other AP shape parameters (depolarization rate and threshold) did not change significantly after application of TEA or 4-AP. The values for electrophysiological parameters of the cells in control and after application of TEA or 4-AP are listed in Table 2. Table 2. Effects of 1 mM TEA or 200 μM 4-AP on the firing patterns and single AP shape of RGCs. Values are means ± S.E.M, n = 6 for TEA and n = 6 for 4-AP. * P < 0.05, ** P < 0.01, *** P < 0.001. Paired t-tests for values of potentials (control/blocker), one sample t-tests for changes (in %) of depolarization and repolarization rates, maximal steady-state firing frequencies and widths. For values that did not change significantly the value of P is indicated. The same 4-AP or TEA-induced effects were apparent in all cells studied (even in cells with maximal steady-state firing frequency lower than 50 Hz). So we concluded that 4-AP and TEA-sensitive channels are expressed in all or at least in large majority of tonically firing RGCs. Pharmacological specificities of 4-AP and TEA are not limited to Kv3 potassium channels. Few other known K+ channels are also significantly inhibited by these drugs in our concentrations (see Discussion). The similar sensitivity to 4-AP and TEA also have Kv1.1 channels (IC50 ~ 0.3 mM for TEA and 290 μM for 4-AP ). However, application of α-dendrotoxin (α-DTX) (100 nM, n = 5) (IC50 ~ 20 nM for Kv1.1 channels ) never resulted in changes similar to 4-AP or TEA-evoked (see figure). The single-cell RT-PCR experiments confirmed the expression of Kv3 channels in the RGCs. Kv3 mRNA was detected in each of the 9 tonically firing cells studied: in 3 cells we detected both Kv3.1 and Kv3.2 mRNA, in 3 cells only Kv3.1 mRNA, and in 3 cells only Kv3.2 mRNA (Fig. 4). Fig. 4. Single-cell RT-PCR amplification of Kv3.1 and Kv3.2 potassium channels using reverse-transcribed mRNA aspirated from an individual retinal ganglion cell of rat immediately after electrophysiological recording. Fragment sizes of PCR products were determined from the accompanying DNA ladder (lane 1). (A) and (B) are from the same cells aspirated during one experiment. (A) Kv3.1 amplification; (B) Kv3.2 amplification. For (A) and (B): lane 2 – the first cell (maximal steady-state firing frequency – 43.5 Hz); lane 3 – the second cell (frequency – 79.9 Hz); lane 4 – the third cell (frequency – 58.4 Hz); lane 5 – negative control (outside) (see Materials and methods); lane 6 – negative control (water) (see Materials and methods). We also analyzed the influence of TEA on ongoing activity. We selected 4 cells which exhibited frequent ongoing spiking for our analysis. The mean interval between ongoing spikes, calculated from our recordings (duration – 30 seconds), lied in the range from 28.4 to 107.8 ms for these cells. The minimal interval between the spikes was in the range from 11.2 to 13.9 ms for the cells. The mean interval between spikes was significantly increased (by 102 ± 13%, n = 4, P < 0.01) after addition of 1 mM TEA (Fig. 5). Thus, cells exhibited frequent ongoing firing needed Kv3 conductance to maintain this firing. Fig. 5. Influence of tetraethylammonium (TEA; 1 mM) on ongoing activity of RGC. The traces in control, in the presence of TEA and on washout were obtained without stimulation. Holding currents were equal to zero in these experiments. Inward conductance of RGCs is mediated by TTX-sensitive sodium and voltage-activated calcium channels [26;33]. Blocking of sodium conductance by TTX (1 μM, n = 4) caused complete and reversible block of spike generation (see figure). Suppression of Ca2+ influx through voltage-activated Ca2+ channels by Cd2+ (200 μM, n = 6) did not abolish the basic pattern of tonic firing (Fig. 6A). Maximal steady-state firing frequency did not change significantly (changed by 9 ± 7%, n = 6, P = 0.25). However, we found certain moderate modifications of firing patterns when comparing spike trains evoked by the same stimulus in tonic range before and after application of cadmium. Only the cells (n = 4) with very stable recording were selected for such analysis (i.e., we selected only the cells with the input resistance fluctuations during experiment less than 15%). The spike trains in cadmium generally had larger steady-state firing frequency than in control (Fig. 6B). We computed the percent of stimulation intensities at which the increase of steady-state firing frequency was observed for each cell. Mean value of this percent was 88 ± 8% (n = 4). This value was significantly (P < 0.05, n = 4, Student’s t-test) higher than 50%, so we concluded that this increase was not due to random fluctuation of frequency. The same increase of frequency was apparent at the beginning of the stimulus-evoked spike trains (the analogous percent for instantaneous frequency, calculated for the first interspike interval was 91 ± 3%, n = 4, P < 0.001 vs. 50%, data not shown). Thus, after calcium influx suppression we did not find the significant increase of maximal steady-state firing frequency calculated at the strongest stimulations, however the moderate increase of this frequency at majority of intensities in tonic range was apparent. Fig. 6. Influence of cadmium (Cd2+, 200 μM) on RGCs firing pattern. (A) Cd2+ did not abolish the basic pattern of tonic firing. Left panel shows repetitive firing under control, right panel – in the presence of Cd2+. 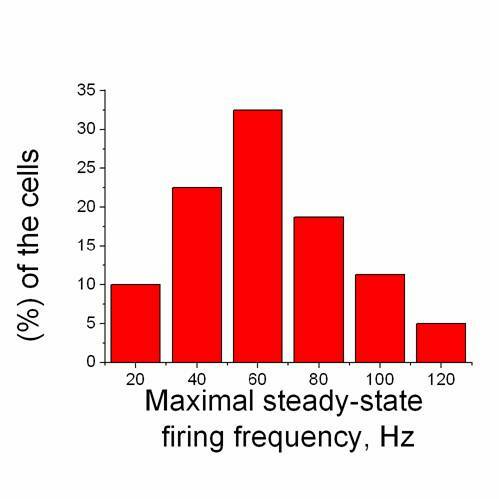 Holding current –60 pA. (B) Increase of steady-state firing frequency was observed at majority of stimulation intensities in tonic range for all 4 cells studied. These graphs (1-4) represent plots of the steady-state firing frequency as function of injected current for these 4 cells. Graph 4 represent the cell in A. Graphs 2 and 3 represent cells with strong tonic synaptic activity, which could also be affected by Cd2+ due to suppression of calcium influx in presynaptic cells. Cd2+ also significantly changed single AP shape: repolarization rate was significantly increased (by 17 ± 5%, P < 0.05, n = 6). A significant decrease of AP width (by 9 ± 2%, P < 0.05, n = 6) was mainly due to increase of repolarization rate, because depolarization rate did not change significantly (changed by 3 ± 5%, n = 6, P = 0.55). Mean values were changed from −180 ± 18 to −210 ± 20 mV/ms (repolarization rate) and from 0.67 ± 0.06 to 0.60 ± 0.05 ms (width) after application of Cd2+ (n = 6). Retinal ganglion cells of rat are divisible into some types, differing in their receptive field properties and morphology [20;21]. In this work we did not investigate the morphological features of the neurons recorded. However, some data pointed out that recordings were made from cells of different types. As it was shown for cat , retinal ganglion cell types are clearly different in their input resistances in more than 30 times (1048 MΩ for zeta cells vs 31.3 MΩ for alpha cells). O`Brien and colleagues observed marked differences (in order of magnitude) among different cell types in the membrane time constants. Single AP width also differed among morphological types according to this report. Therefore our data (which showed the striking differences in whole cell capacitances, input resistances, membrane time constants, and some of the single AP shape parameters between different cells) could be explained by recording from different types of RGCs, which (similar to different RGC types of cat) have different electrophysiological properties. In our recordings two types of firing patterns were clearly distinguishable: the most of the neurons were tonic cells, also there were few phasic cells. Other studies also showed that tonically firing neurons constitute the overwhelming majority of mature mammalian RGCs [18;33]. On the contrary, the large subset of mature RGCs of different non-mammalian vertebrate species are phasic neurons [11;17;29]. Single APs of RGCs were characterized by short width and apparent in majority of the cells initial segment – soma-dendritic break. 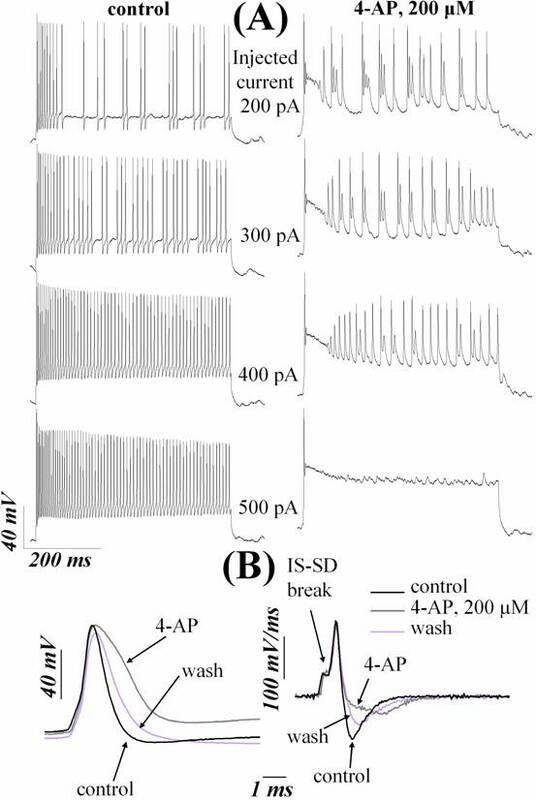 The existence of IS-SD break could be explained by the fact that retinal ganglion cells had a sharply defined region of high sodium channel density at the axon initial segment (including axon hillock), responsible for spike initiation in these neurons . Short width of RGC APs could be explained by the fast repolarization, which was highly sensitive to blockers of Kv3 channels. In some subsets of tonically firing neurons we observed the marked influence on firing pattern by conductances, which could be activated only after preceding hyperpolarization. It is important to note that hyperpolarization used in this study was close to −80 mV, and we did not study the effect of more stronger pre-hyperpolarizations. Mitra and Miller  suggested that the phenomenon of rebound excitation was caused by two types of channels: LVA Ca2+ channels and hyperpolarization-activated cation (HCN) channels, mediating Ih current. The evidence of importance of Ih channels for firing the rebound bursts in rat RGCs was found by Lee and Ishida . Recent reports [14;18] elucidated, which types of mammalian RGCs fire rebound bursts. The phenomenon of ramping was studied on mature mammalian RGCs earlier  and was suggested to be mediated by slowly inactivating K+ current termed IB. This current activates rapidly at voltages subthreshold for spike generation and inactivates very slowly over hundreds of milliseconds, and is similar to another current (ID), originally described in hippocampal cells. These “D” or “B” channels are probably various combinations of Kv1.2 (or Kv1.1 or Kv1.6) with other Kv1 proteins and Kvβ subunits . Similar to O’Brien and colleagues  we observed ramping only in small subset of RGCs. Tonically firing RGCs of rat exhibited high steady-state firing frequency. Comparison of our data with recordings from fast-spiking neocortical interneurons  led to observation that 63.5% of the RGCs had the maximal steady-state firing frequency larger than 50 Hz and, hence, are comparable with fast-spiking interneurons by this parameter (which also had lower bound of 50 Hz for this frequency). Further comparison showed that mean maximal steady-state firing frequency of fast-spiking interneurons (123.2 ± 11.1 Hz) fell within the range of maximal steady-state firing frequencies of the RGCs (up to 124.2 Hz). That is why we could definitely classify most of the recorded cells as fast-spiking neurons [4;7;13]. This conclusion led to assumption that RGCs express Kv3 potassium channels, which are necessary and sufficient for the fast-spiking phenotype of many different types of neurons [6;7;13;15;16;24;25]. We tested this assumption using application of two drugs: 4-AP (200 μM) and TEA (1 mM), either of which inhibits Kv3 conductance in concentrations indicated [3;6;7;9;13;15;16;24;25]. The profound effects of these drugs on AP shape and repetitive firing added the evidence that RGCs indeed express Kv3 conductance, which mainly shapes the repolarizations and fast afterhyperpolarizations of APs, providing the RGCs with ability for high-frequency spike generation. Used concentration of TEA produces significant inhibition of only a few other known K+ channels. These include the following channels (with IC50 or Kd indicated): large-conductance Ca2+ activated K+ channels, containing proteins of the slo family (80-330 μM), Kv 1.1 channels (0.3 mM), and KCNQ2 (0.16-0.5 mM) [3;7;9;24;25]. However, these channel types can be distinguished from Kv3 by other pharmacological properties. Ca2+ activated K+ channels, containing proteins of the slo family, were suppressed in our experiments by blocking the Ca2+ influx through voltage-activated Ca2+ channels by application of Cd2+ (200 μM). These applications did not produce effects, which were in any way similar to the TEA-evoked profound changes. Since KCNQ2 subunits form very slowly activating and deactivating channels (time constants of hundreds of milliseconds to seconds) which would not be significantly activated during single APs, their blocking could not produce changes similar to the TEA-evoked [3;7;24]. Also, KCNQ2 and slo channels are not blocked even by large concentrations of 4-AP (KCNQ2 are not blocked by 2 mM 4-AP ; also 5 mM of 4-AP do not block calcium-activated potassium channels in RGCs of rat ). However, application of 4-AP (200 μM) in our experiments caused effects very similar to TEA-evoked. To test the possible involvement of Kv1.1 channels we applied a toxin specific for several Kv1 channels (α-DTX). However, application of α-DTX also did not produce effects, which were in any way similar to the TEA or 4-AP-evoked profound changes. These results support the hypothesis that Kv3 potassium channels are expressed in tonically firing RGCs and they powerfully shape APs and repetitive firing properties of these neurons. Our single-cell RT-PCR experiments confirmed the expression of Kv3 channels in the RGCs. Interestingly, we found that different cells expressed different (Kv3.1, Kv3.2, or both) mRNA, however, we detected at least one of these transcripts in each of the cells tested. The evidence for the expression and importance of Kv3 channels for RGCs tonic firing can be summarized in the following order: 1) The majority of tonically firing RGCs exhibited clear fast-spiking phenotype. Kv3 channels have unique biophysical properties necessary to enable repetitive firing at high frequencies . No data are available indicating that there are alternative solutions in neurons to achieve high-frequency repetitive firing . 2) The pharmacological properties of potassium conductance mainly responsible for tonic firing in the recorded cells fully resembled the pharmacological properties of Kv3 channels in heterologous expression systems. 4) Effects of Kv3-like conductance suppression in RGCs was highly similar to effects of blocking of Kv3 channels in other neurons [6;7;15;16;24]. 5). Our single-cell RT-PCR experiments confirmed the expression of Kv3 channels in the RGCs. Increase of ongoing firing interpulse intervals, which were observed in our experiments after application of TEA, suggested that Kv3 conductance contributes to the ability of RGCs to preserve the timing information contained in sensory signals. Such a role of Kv3 conductance suggested earlier for auditory neurons, distributing the auditory signals [24;25], and for “pump” neurons of the nucleous tractus solitarii, distributing the lung inflation signal throughout the appropriate circuitry . Thus, we might conclude that many types of sensory neurons use Kv3 conductance in order to transmit the high-frequency sensory signals faithfully. Thus, utilizing biophysical, pharmacological, and single-cell RT-PCR approach, we have shown the prominent role of Kv3 conductance at least in large majority of rat RGCs. This conductance is mediated mainly by Kv3.1 and Kv3.2 subunits, because they promote high frequency firing, whereas inactivating Kv3.3 and Kv3.4 subunits does not promote it [13;24]. Also, the reported IC50 values shows weaker sensitivity of Kv3.3-Kv3.4 channels to 4-AP (IC50 ~ 1.2 mM for Kv3.3 and 0.5-0.6 mM for Kv3.4 [3;9]). Expression of mammalian homologues of Kv3 subunits was recently shown for majority of RGCs of mature trout [10;11]. However, recent report  showed that only a very few RGCs of mature mice express Kv3.1 and Kv3.2 subunits. These negative results were obtained by immunohistochemical approach only. The report of Ozaita and colleagues  definitely conflicts with our data, because in our experiments the majority of the cells have the ability for high-frequency firing, all cells studied have the high sensitivity to Kv3 channels blockers, and all cells studied were Kv3-positive. It is unlikely that this discrepancy is caused by species differences between different rodents. Our data also suggested the physiological roles of two types of known inward depolarization-activated conductances in RGCs: TTX-sensitive sodium  and voltage-activated calcium  conductances. We concluded that depolarizing phase of AP is generated by TTX-sensitive sodium conductance, large part of which is localized in axon initial segment, while Ca2+ currents influenced significantly the repolarizing phase of AP, slowing the repolarization. The increase of the steady-state firing frequency observed in our experiments after application of Cd2+ could be caused not only by suppression of Ca2+ current in itself, but also by suppression of Ca2+ -activated potassium conductance . It is important to note that calcium conductance in RGCs is changed profoundly during development . This can be the reason why our data indicating only regulatory role of calcium currents in shaping RGCs firing patterns was different from the data of Rothe and colleagues, who studied RGCs of immature mice. 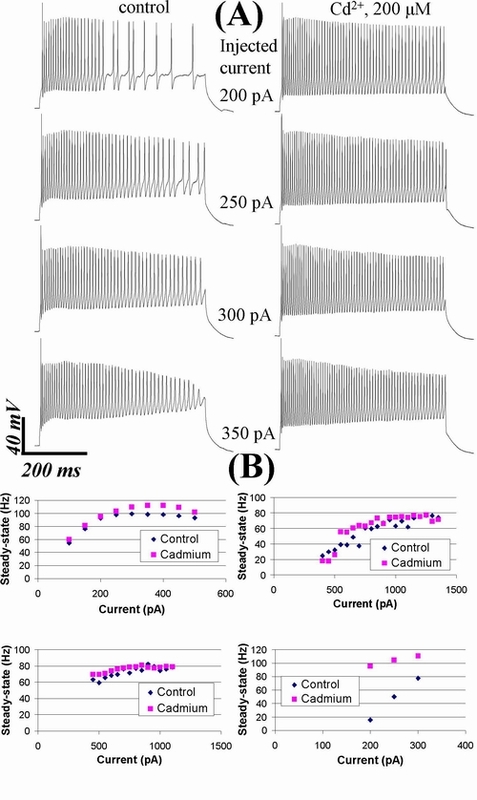 Analogous experiments with suppression of calcium conductance by cadmium led to block of sustained repetitive discharge in the retinal ganglion cells of 5 days old mice . Thus, we conclude that 1) the basic pattern of RGCs tonic firing is generated by TTX-sensitive sodium and Kv3 potassium conductance 2) Ca2+ and Ca2+ -dependent conductances only moderately stabilize tonic firing, often decreasing discharge steady-state frequency, and moderately influence single AP shape 3) Kv3 conductance contributes to the ability of RGCs to preserve the timing information contained in high-frequency visual signals. 1. Akamine,T., Nishimura,Y., Ito,K., Uji,Y., and Yamamoto,T., Effects of haloperidol on K(+) currents in acutely isolated rat retinal ganglion cells, Invest Ophthalmol. Vis. Sci., 43 (2002) 1257-1261. 2. Baylor,D.A. and Fettiplace,R., Synaptic drive and impulse generation in ganglion cells of turtle retina, J. Physiol, 288 (1979) 107-127. 3. Coetzee,W.A., Amarillo,Y., Chiu,J., Chow,A., Lau,D., McCormack,T., Moreno,H., Nadal,M.S., Ozaita,A., Pountney,D., Saganich,M., Vega-Saenz,d.M., and Rudy,B., Molecular diversity of K+ channels, Ann. N. Y. Acad. Sci., 868 (1999) 233-285. 4. Connors,B.W. and Gutnick,M.J., Intrinsic firing patterns of diverse neocortical neurons, Trends Neurosci., 13 (1990) 99-104. 5. COOMBS,J.S., CURTIS,D.R., and ECCLES,J.C., The interpretation of spike potentials of motoneurones, J. Physiol, 139 (1957) 198-231. 6. Dallas,M.L., Atkinson,L., Milligan,C.J., Morris,N.P., Lewis,D.I., Deuchars,S.A., and Deuchars,J., Localization and function of the Kv3.1b subunit in the rat medulla oblongata: focus on the nucleus tractus solitarii, J. Physiol, 562 (2005) 655-672. 7. Erisir,A., Lau,D., Rudy,B., and Leonard,C.S., Function of specific K(+) channels in sustained high-frequency firing of fast-spiking neocortical interneurons, J. Neurophysiol., 82 (1999) 2476-2489. 8. Fohlmeister,J.F. and Miller,R.F., Impulse encoding mechanisms of ganglion cells in the tiger salamander retina, J. Neurophysiol., 78 (1997) 1935-1947. 9. Gutman,G.A., Chandy,K.G., Grissmer,S., Lazdunski,M., McKinnon,D., Pardo,L.A., Robertson,G.A., Rudy,B., Sanguinetti,M.C., Stuhmer,W., and Wang,X., International Union of Pharmacology. LIII. Nomenclature and molecular relationships of voltage-gated potassium channels, Pharmacol. Rev., 57 (2005) 473-508. 10. Henne,J. and Jeserich,G., Maturation of spiking activity in trout retinal ganglion cells coincides with upregulation of Kv3.1- and BK-related potassium channels, J. Neurosci. Res., 75 (2004) 44-54. 11. Henne,J., Pottering,S., and Jeserich,G., Voltage-gated potassium channels in retinal ganglion cells of trout: a combined biophysical, pharmacological, and single-cell RT-PCR approach, J. Neurosci. Res., 62 (2000) 629-637. 12. Lee,S.C. and Ishida,A.T., Ih without Kir in adult rat retinal ganglion cells, J. Neurophysiol., 97 (2007) 3790-3799. 13. Lien,C.C. and Jonas,P., Kv3 potassium conductance is necessary and kinetically optimized for high-frequency action potential generation in hippocampal interneurons, J. Neurosci., 23 (2003) 2058-2068. 14. Margolis,D.J. and Detwiler,P.B., Different mechanisms generate maintained activity in ON and OFF retinal ganglion cells, J. Neurosci., 27 (2007) 5994-6005. 15. Martina,M., Schultz,J.H., Ehmke,H., Monyer,H., and Jonas,P., Functional and molecular differences between voltage-gated K+ channels of fast-spiking interneurons and pyramidal neurons of rat hippocampus, J. Neurosci., 18 (1998) 8111-8125. 16. Massengill,J.L., Smith,M.A., Son,D.I., and O'Dowd,D.K., Differential expression of K4-AP currents and Kv3.1 potassium channel transcripts in cortical neurons that develop distinct firing phenotypes, J. Neurosci., 17 (1997) 3136-3147. 17. Mitra,P. and Miller,R.F., Normal and rebound impulse firing in retinal ganglion cells, Vis. Neurosci., 24 (2007) 79-90. 18. O'Brien,B.J., Isayama,T., Richardson,R., and Berson,D.M., Intrinsic physiological properties of cat retinal ganglion cells, J. Physiol, 538 (2002) 787-802. 19. Ozaita,A., Petit-Jacques,J., Volgyi,B., Ho,C.S., Joho,R.H., Bloomfield,S.A., and Rudy,B., A unique role for Kv3 voltage-gated potassium channels in starburst amacrine cell signaling in mouse retina, J. Neurosci., 24 (2004) 7335-7343. 20. Peichl,L., Alpha and delta ganglion cells in the rat retina, J. Comp Neurol., 286 (1989) 120-139. 21. Perry,V.H., The ganglion cell layer of the retina of the rat: a Golgi study, Proc. R. Soc. Lond B Biol. Sci., 204 (1979) 363-375. 22. Pinto,L.H. and Klumpp,D.J., Localization of potassium channels in the retina, Prog. Retin. Eye Res., 17 (1998) 207-230. 23. Rothe,T., Juttner,R., Bahring,R., and Grantyn,R., Ion conductances related to development of repetitive firing in mouse retinal ganglion neurons in situ, J. Neurobiol., 38 (1999) 191-206. 24. Rudy,B., Chow,A., Lau,D., Amarillo,Y., Ozaita,A., Saganich,M., Moreno,H., Nadal,M.S., Hernandez-Pineda,R., Hernandez-Cruz,A., Erisir,A., Leonard,C., and Vega-Saenz,d.M., Contributions of Kv3 channels to neuronal excitability, Ann. N. Y. Acad. Sci., 868 (1999) 304-343. 25. Rudy,B. and McBain,C.J., Kv3 channels: voltage-gated K+ channels designed for high-frequency repetitive firing, Trends Neurosci., 24 (2001) 517-526. 26. Schmid,S. and Guenther,E., Voltage-activated calcium currents in rat retinal ganglion cells in situ: changes during prenatal and postnatal development, J. Neurosci., 19 (1999) 3486-3494. 27. Sheasby,B.W. and Fohlmeister,J.F., Impulse encoding across the dendritic morphologies of retinal ganglion cells, J. Neurophysiol., 81 (1999) 1685-1698. 28. Tabata,T. and Ishida,A.T., Transient and sustained depolarization of retinal ganglion cells by Ih, J. Neurophysiol., 75 (1996) 1932-1943. 29. Tabata,T. and Kano,M., Heterogeneous intrinsic firing properties of vertebrate retinal ganglion cells, J. Neurophysiol., 87 (2002) 30-41. 30. Taschenberger,H. and Grantyn,R., Interaction of calcium-permeable non-N-methyl-D-aspartate receptor channels with voltage-activated potassium and calcium currents in rat retinal ganglion cells in vitro, Neuroscience, 84 (1998) 877-896. 31. Taschenberger,H., Juttner,R., and Grantyn,R., Ca2+-permeable P2X receptor channels in cultured rat retinal ganglion cells, J. Neurosci., 19 (1999) 3353-3366. 32. Tian,N., Hwang,T.N., and Copenhagen,D.R., Analysis of excitatory and inhibitory spontaneous synaptic activity in mouse retinal ganglion cells, J. Neurophysiol., 80 (1998) 1327-1340. 33. Wang,G.Y., Ratto,G., Bisti,S., and Chalupa,L.M., Functional development of intrinsic properties in ganglion cells of the mammalian retina, J. Neurophysiol., 78 (1997) 2895-2903. 34. Wang,G.Y., Robinson,D.W., and Chalupa,L.M., Calcium-activated potassium conductances in retinal ganglion cells of the ferret, J. Neurophysiol., 79 (1998) 151-158. 35. Wollner,D.A. and Catterall,W.A., Localization of sodium channels in axon hillocks and initial segments of retinal ganglion cells, Proc. Natl. Acad. Sci. U. S. A, 83 (1986) 8424-8428.